Salivary estrogen/progesterone testing has yet to prove sufficient accuracy for my needs (highlighted in my earlier post – “The Problems With Hormone Testing of Estrogen & Progesterone”), even if it was, neither salivary or serum hormone testing is necessary (or even rarely helpful) for the perimenopausal woman as it is difficult to gather conclusions on test results when the hormones are in such a fluctuating state. There are so many peaks and valleys and erratic hormone activity, that testing offers little value in most situations. For the women taking HT, it is tempting to think that we could test the blood or the saliva to determine what dose to take. This is a popular recommendation in some consumer menopause books. However, there is no mathematical grid or equation comparing values of estrogen or progesterone or testosterone levels in the blood or saliva and how that would equate with a certain dose of the comparable hormone. There are reference ranges for these hormones, but we don’t know exactly what dose to give, in order to keep the woman in the reference range. Women absorb and metabolize hormones differently. The form of hormones and the delivery method- oral, transdermal, sublingual, injection- also behave differently from woman to woman. In very occasional and selective cases, serum estrogen or testosterone testing may be a helpful guide in a perimenopausal or menopausal women on estrogen/testosterone. These are generally cases in which a woman is on HT and not doing well and despite our best efforts with a good medical history and adjusting the dose, she still does not feel well. The majority of the time, it requires the practitioner’s experience and menopause expertise and time to listen to the patient, to know what dose, what dosing adjustments and what forms and deliveries of hormones may work best. Even if testing is done, it basically comes down to good clinical judgement and the willingness of the woman and her practitioner to try something else. Urinary testing of estrogen metabolites can be considered in evaluating a woman’s risk of health care problems that may be associated with higher or lower levels of certain estrogen metabolites. Using estrogen metabolism testing is a preventive medicine practice that is still unfolding in usefulness. Recent research has shed serious doubt on the utility of 2-hydroxyestrogen: 16-hydroxy estrogens. The 4-hydroxyestrogens may still be fruitful territory. I realize and respect, that clinicians think through patient management issues differently. When we don’t need a test to rule out or rule in a condition, some of us may need more tests to feel more assured of our advice. The health care dollar has become more and more precious. In my experience these last 30 years, I find that those areas in which I have less expertise, I’m vulnerable to four shortcomings: unnecessary tests, too few or too many tests, the wrong tests. In my experience and opinion, the more expertise one has in perimenopause/menopause …the less the need for any hormone testing for patient management. However, some patients want one or more methods of hormone testing for their menopause issues. I respectfully listen to their needs, share my thoughts and provide pertinent patient education, make my recommendations, and order the tests if they really want them. If they already have tests that have been done previously, I politely review the results without disparaging comments as to lack of necessity of these tests or to their previous practitioner(s), and move on to dealing with the needs at hand. My position that hormone testing during periomenpause is not necessary is likely to be unpopular with some of my colleagues and those in the “alternative” laboratory industry. 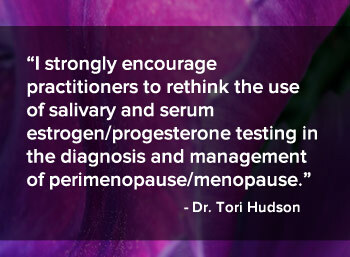 Nonetheless, I would strongly encourage practitioners to rethink the use of salivary and serum estrogen/progesterone testing in the diagnosis and management of perimenopause/menopause. In a perimenopausal woman these hormones fluctuate within a day and from day to day. In the postmenopausal woman, not on HT, I would also assert that this is a poor use of a woman’s funds. Her estrogen and progesterone levels are low. She is a postmenopausal woman and mother nature had this in mind. For a postmenopausal patient on HT, it is rarely necessary to test her estrogen or testosterone levels for prescription management; however, there are times when this may help determine absorption/delivery and dosing issues due to her lack of response or adverse response to customary prescriptions. For select and very difficult cases, especially those that involve occasional anxiety, it is likely more useful to utilize testing of her salivary cortisol, neurotransmitters, amino acids and nutrients, while assuring that we have done our due diligence with the basics of history, physical exam and conventional testing considerations.